The small community of Sweeny, Texas is the westernmost incorporated town in Brazoria County. Hurricane Harvey passed through Sweeny, Texas from August 24 through 28, 2017. While the hurricane itself had a minimal impact on Sweeny, corporate self-preservation led to a massive disaster in its aftermath. 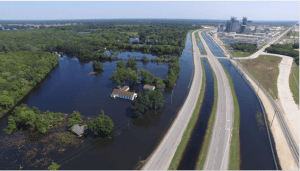 During and after Hurricane Harvey, the people of Sweeny relied on the Linnville Bayous to funnel the upstream flow of water out of the town and downstream towards the Gulf of Mexico. Unfortunately, Phillips 66 and Chevron Phillips worked overnight damming these bayous to barricade the Sweeny Refinery—a multi-billion-dollar investment for the corporations. They started erecting dams in both the Linnville and Little Linnville Bayous in the dark of night on Wednesday August 30, 2017 without informing the public. The corporations took these self-serving actions in secret, knowing their actions would cause a devastating, unprecedented flood, even having been told by their own hydrologists that the town was going to flood because of the dams. Because of the dams, the water level in Sweeny rose significantly, flooding the inside of many homes and trapping many individuals inside of their houses. Livestock and sowed land were lost as well. Beyond property damage and destruction, multiple alleged chemical and petroleum spills occurred in the Sweeny Refinery and may have also contaminated the floodwaters. Walston Bowlin, LLP attorneys Josh Bowlin, Nathan Alford, and Aamir Siddik are serving as lead lawyers representing over 300 Sweeny, Texas homeowners and business owners in a Brazoria County lawsuit against international Petroleum giants Phillips 66, Chevron Phillips LLC, and Chevron Phillips LP. The firm represents the vast majority of plaintiffs. If you are a resident in Sweeny, Texas affected by the actions of these companies, contact us today to find out how we can help you.